Laser Run featured in a record-breaking family sports day held at Cempaka Schools in Malaysia as part of its 35th anniversary celebrations. Students, parents, teachers and school alumni joined to participate in the Laser Run event, which was an official attempt to enter the Guinness Book of World Records and Malaysian Book of Records. A total of 636 participants of all ages (from five to 75) completed the course, which was shaped in the number “35” in recognition of the special anniversary. 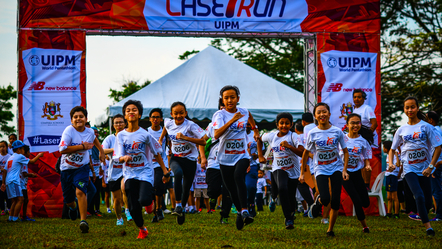 Laser Run is still a new sport in Malaysia and this was only the second event organized in the country, but Cempaka Schools has played an important role in its development by introducing Laser Run to its physical education curriculum. All students from Years 1-11 have learned the foundations of Laser Run and specifically the techniques of laser shooting, which formed part of their final assessment and grading for the first term of the 2018/2019 academic year. Cempaka Schools Malaysia founder, Dato’ Freida Mohd Pilus, said the Laser Run was a blend of the school’s objective: life and sports. “It is also how we strive for our targets in life and we have five main targets – humility, happiness, togetherness, empathy and joy. It justifies our objectives to work together as a family,” she said in a report published by The Star newspaper.